When: Fri., April 19, 6:30 p.m., Sat., April 20, 6:30 p.m., Sun., April 21, 6:30 p.m., Mon., April 22, 6:30 p.m. and Tue., April 23, 6:30 p.m. 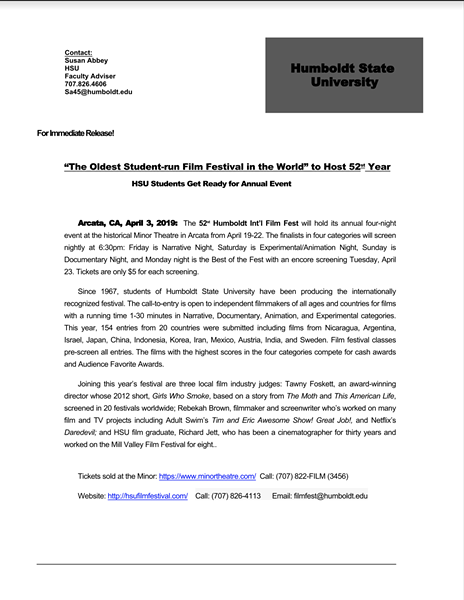 The 52nd Humboldt Int’l Film Fest will hold its annual four-night event at the historic Minor Theatre in Arcata from April 19-22. The finalists in four categories will screen nightly at 6:30pm: Friday is Narrative Night, Saturday is Experimental/Animation Night, Sunday is Documentary Night, and Monday night is the Best of the Fest with an encore screening Tuesday, April 23. Tickets are only $5 for each screening.